The following is a guest-post from John Garrison Marks. John is a Ph.D. candidate in the Department of History at Rice University, studying race and freedom in the urban black Atlantic World. He is currently living in Bogotá, Colombia, conducting dissertation research. You can access more of his writing at his blog, and you can also find him on Twitter. 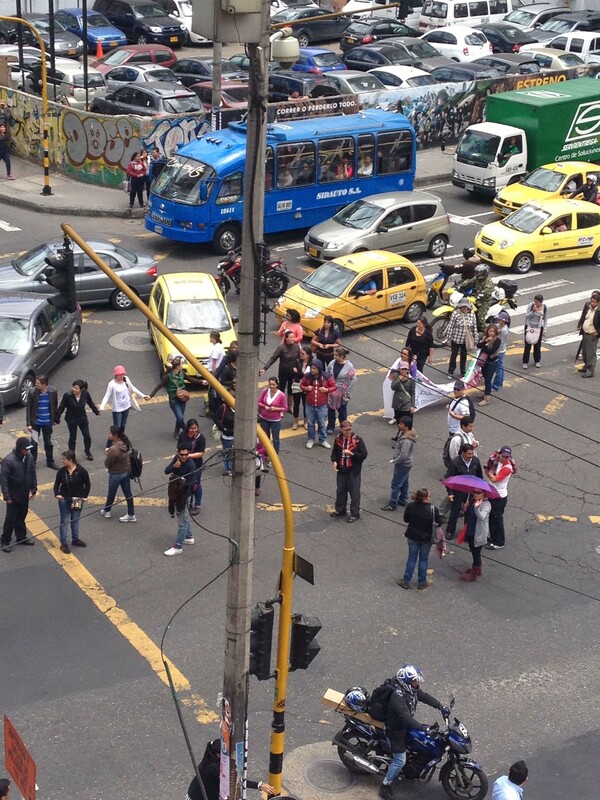 Over the past three weeks, the signs of the protest have been unmistakable in Colombia. What began as a strike among agricultural workers (campesinos) has expanded in recent weeks to include a number of other sectors, particularly teachers, health workers, miners, and students, in what is now being termed the Paro Nacional or Paro Popular. 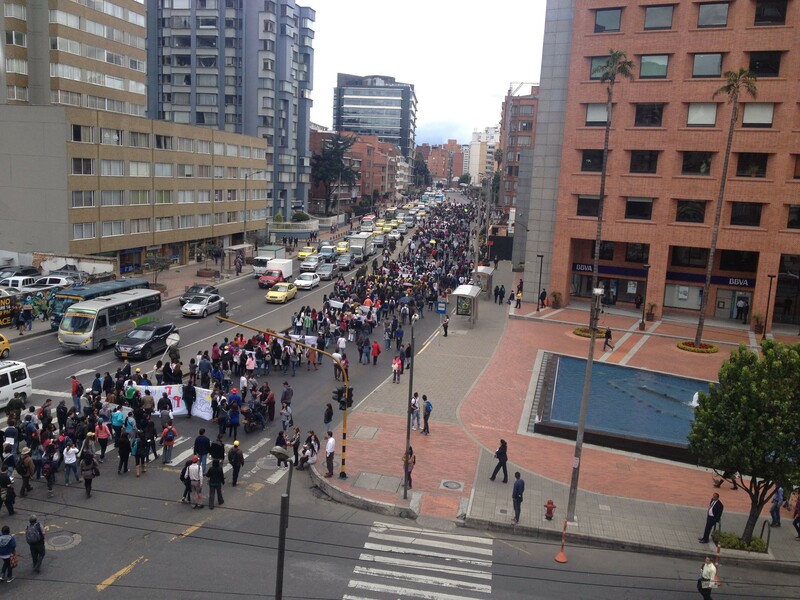 I’ve been living in Bogotá since June, so I’ve seen some of these demonstrations first hand. The Paro Agrario Nacional began on August 19th, as farm workers in various industries expressed complaints about the government’s economic policies. Among other grievances, Colombia’s farmers allege that the government’s importation of cheap foodstuffs—milk, rice, onions, potatoes—is driving them into bankruptcy, among other complaints. To express their displeasure, the campesinos went on strike, staging protests on major highways throughout the country, often blocking the roads. In some areas of Colombia, like Boyacá, these demonstrations were accompanied by violence, as the protestors punctured tires and smashed windows of vehicles trying to pass the roadblocks. I was in the town of Villa de Leyva when the demonstrations began, and ended up stuck there for an extra night as busses were unable or unwilling to make the trip from Bogotá. It was estimated that as many as one million people took part in broad anti-government protests on the 19th. The following week, Colombian President Juan Manuel Santos exacerbated the situation in his response to the protests, by claiming that “The national agrarian strike does not exist,” denying that the claims of the striking sectors were legitimate. 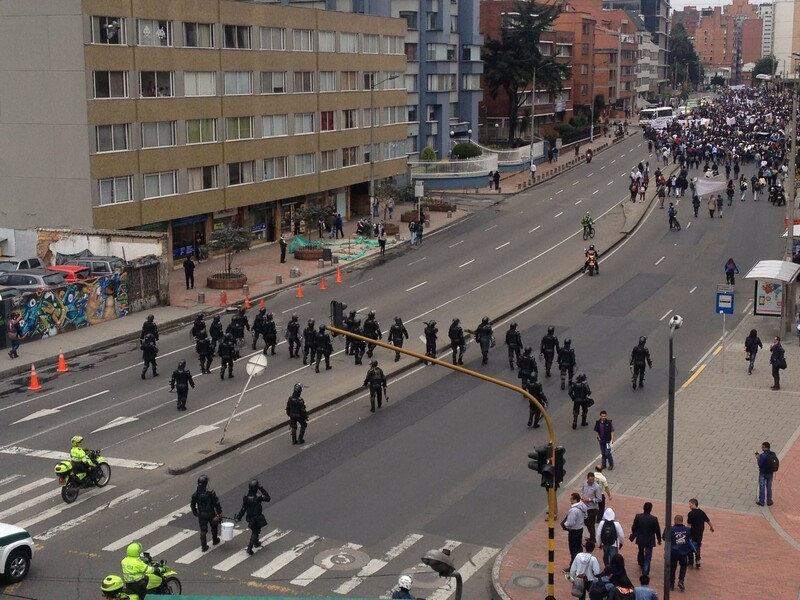 This response seemingly set off a new wave of anti-government protests in Bogotá, as the strikes and demonstrations continued in other parts of the country. On August 29th, a few days after President Santos’s statement, major protests took place throughout the city, with as many as 30,000 people—many of them students—taking part to show their support for the campesinos and to express a host of other grievances against the government. 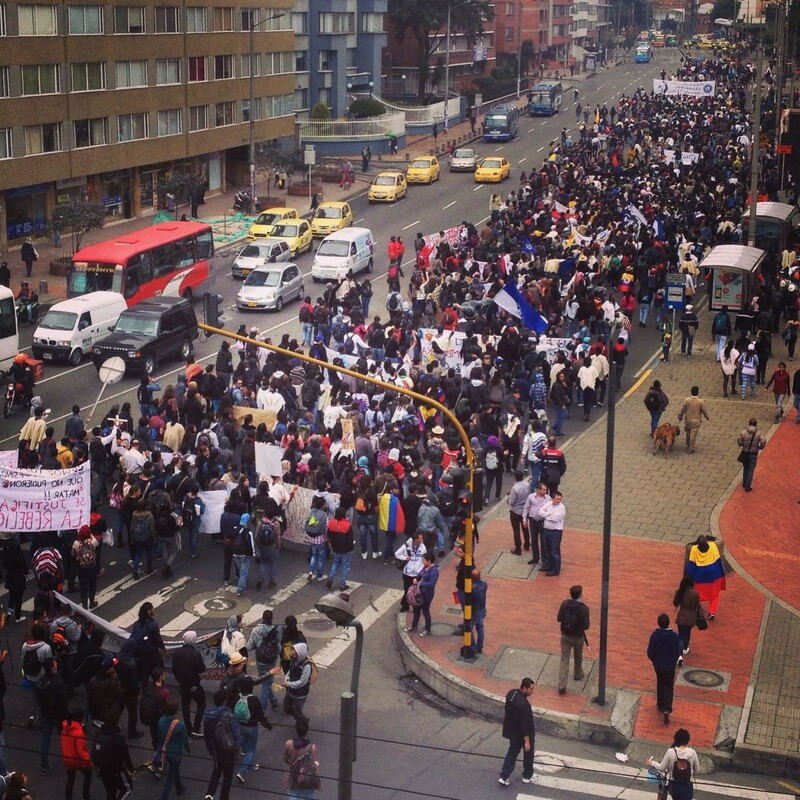 Marches took place throughout Bogotá, with a major crowd ultimately descending on the Plaza Bolívar, the city’s main square. Some of these marches went right past my window on La Septima, one of the city’s main thoroughfares (though they also prevented me from going to the archive near most of the government buildings.) 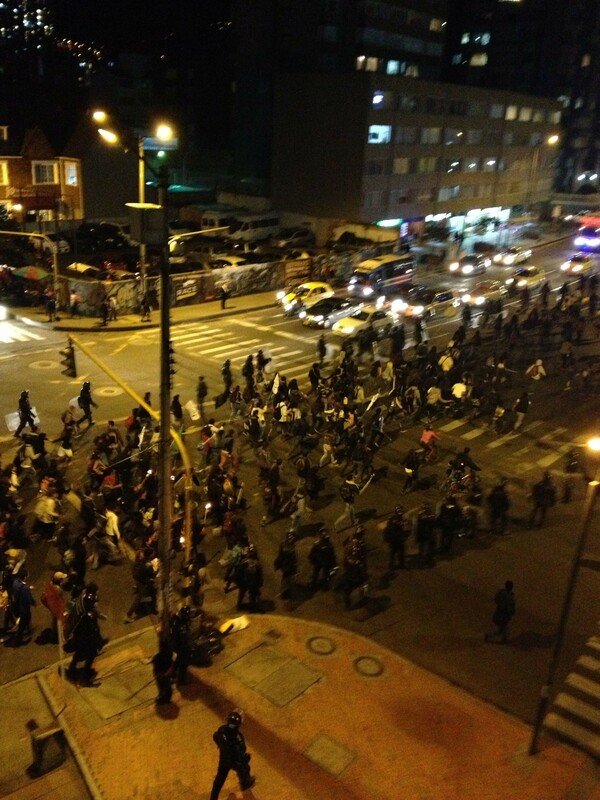 As you can see below, the protesters were followed closely by no small number of riot police. 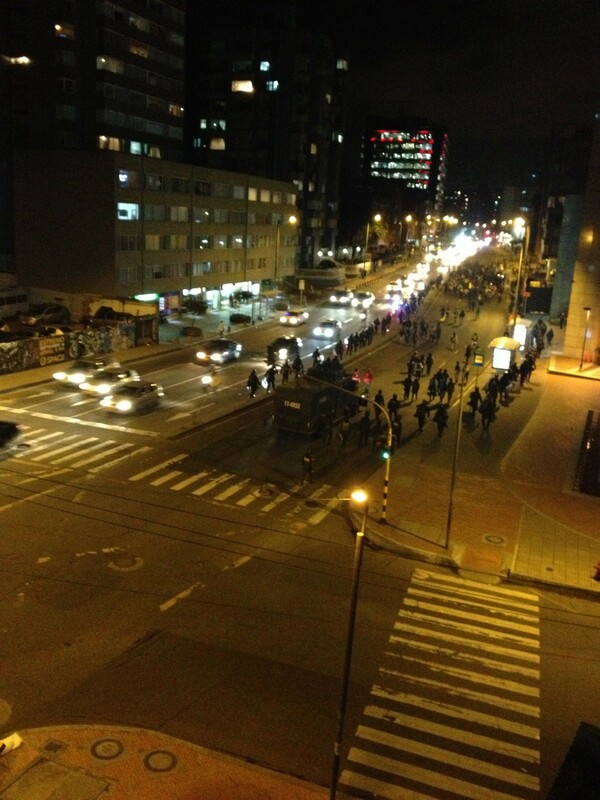 That night, according to some reports, the protests turned violent as protestors allegedly hurled rocks at riot police. Two people were killed by gunfire. The following day, against the backdrop of a host of new graffiti (“A cerrar las vías para abrir el debate” being my personal favorite), President Santos ordered troops to patrol the city’s streets. Even in my neighborhood, far from the site of the alleged violence though home to a number of banks and media outlets, upwards of fifteen well-armed soldiers stood guard on my corner alone. Walking past twenty soldiers with machine guns to get to the National Archives was also quite an experience. Since the major demonstrations of the 29th, the government has entered into discussions with many of the striking sectors, though no broad agreements have yet been reached. President Santos’s entire cabinet also resigned, allowing him to appoint a new “peace and unity” cabinet. Even while the Santos government negotiates with the campesinos, new strikes are yet emerging throughout Colombia. On September 10th, Colombia’s teachers went on strike over an alleged $40 billion in unpaid wages. Thousands of students staged a torch-bearing protest on Wednesday as well, in support of the national teacher’s strike, again pictured here with their riot police escorts. It is an extremely challenging time for the Santos government, as a whole host of sectors feel increasingly empowered to express their displeasure with a wide variety of policies. To date, Santos has yet to announce any major policy changes, meaning the demonstrations will likely continue in one form or another. This entry was posted in Civil Conflict in the Americas, Colombia, Labor in Latin America, Land Reform, Land Struggles & Issues, Protests in Latin America, Strikes. Bookmark the permalink.